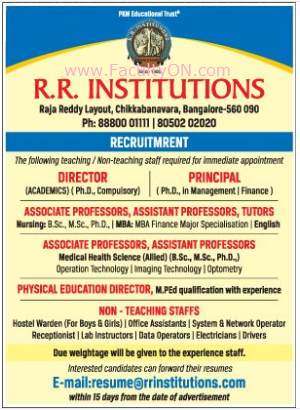 R.R.Institutions, Bangalore has advertised in the DECCAN HERALD newspaper for the recruitment of Teaching Faculty- Associate Professor / Assistant Professor / Principal / Director Plus Non-Faculty jobs vacancies. Interested and eligible job aspirants are requested to apply within 15 days from 19th Sept 2018. Check out further more details below. About College: Bangalore is one of the fastest growing cities in India. It is a multi-cultural city permeating class, religion and language. Bangalore is also a centre of renowned colleges, academic institutions, important central government establishments, scientific and research institutes and organisations. One such Institutions is R.R. Institutions. Presently is has become a Great educational center, hi-tech city with good opportunities. The R.R.Institutions is situated near Chikkabanavara Railway station, 12 Kms away from the huzzle and buzzle of Bangalore city, is an ideal place for learning.